School Regionalization - Gov's half measures are not enough! ﻿CALL TO ACTION: SAVE OUR SCHOOLS! "THE GOVERNOR SUGGESTED EDITS TO THE BILL'S LANGUAGE, SO CONSOLIDATION WON'T HAPPEN, RIGHT?" "IT'S NOT THAT BAD, WE WILL COMBINE WITH DARIEN, RIGHT?" "THE LOONEY AND DUFF BILLS ARE DEAD SO IT WON'T EFFECT US, RIGHT?" ........ WRONG! The Governor presented suggested changes to the Education Committee on SB 874 and Planning and Development Bill, HB 7192, by substituting the words "recommendations" for "plan" and "collaboration" for "consolidation." The Governor is not the legislature; he does not write the final bills, he can only make suggestions. There is no specific clarity on school enrollment thresholds or town population in the Governor's bill or if incentives will be forced/coerced or truly voluntary. JOIN HANDS OFF OUR SCHOOLS NOW! SHARE THIS INFO! Tell your friends and neighbors and explain the dangers of this legislation. 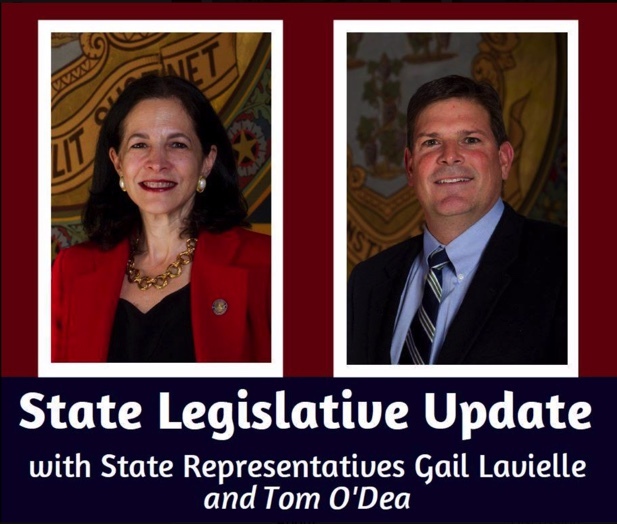 They will be addressing the budget process, the teachers’ pension fund, proposed new taxes and tax expansions, school regionalization, tolls, various House and Senate bills, and more. What will the Democrat bill proposals on school regionalization, tolls, pushing teacher pension costs onto municipalities and $2.4 billion of new taxes mean for New Canaan Residents? Can anything be done legally to forestall government overreach and potential loss of local control of education? Get the inside scoop on the State Legislature: New leaders, new legislation, the most dangerous bills in Hartford and which bills have a real chance. The Yankee Institute for Public Policy Studies is a 501(c)(3) research and citizen education organization that does not accept government funding. 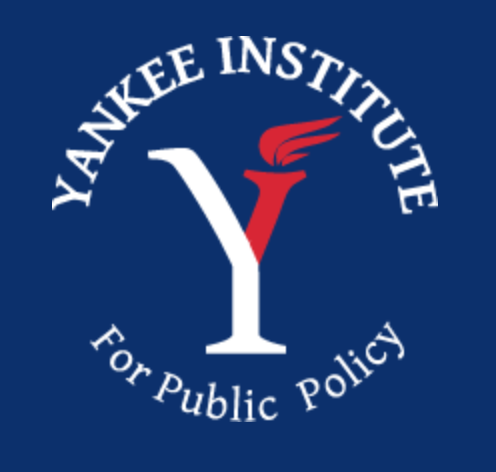 The Yankee Institute develops and advances free-market, limited-government solutions in Connecticut. As one of America’s oldest state-based think tanks, Yankee is a leading advocate for smart, limited government; fairness for taxpayers; and an open road to opportunity. CONTACT THE LEGISLATORS - Draft Letter Below! All Republican Legislators oppose these bills but the Democrats have a Supermajority. I am writing against any and all proposed bills on forced or coerced school consolidation, and regionalization. I oppose any bills that take will ultimately take away local control of education and regionalize education. Why is SB 874 still dangerous and unacceptable? The Governor's budget specifically mentioned school consolidation and regionalization. The Governor's intention and that of many of the committee Democrats has not changed, only the suggested bill language is more vague. The Legislature is not required to vote on any and all recommendations that are developed by the Commission. In Section 1(f) The commission will exist for eight years until June 30, 2027. The looming protracted uncertainty is very detrimental to our local economy. Section 1(b) The Commission consists of 15 of the 17 members appointed by the Democrat Leaders of the Legislature and the Governor who were the ones that submitted consolidation and regionalization bills in the first place. There is little doubt as to their thoughts on the matter. Parents and citizens alike do not have a voice in the formation of the Commission. Only one member is required to be a parent of a student enrolled in a public school. Therefore, the views of parents will not be adequately represented in this composition. Section 2(b) The non-elected commission will be collecting detailed data on school districts including: # of schools, tiers of bussing, travel times, school capacity and enrollment in every district, early education, SPED, after school activities and travel time for that bussing, labor contracts, etc. Why is this info not being collected from the largest cities in CT? Why are they excluded from review? In Section 2(b) The use of the word "collaborations" is vague on its intended meaning and can change over time. "Additional collaboration" is substituted for shared services 2(b)(4); for redistricting 2(b)(8); for school choice 2(b)(10). By 2/1/20 the commission will create a preliminary recommendations concerning "additional collaborations" among school districts and municipalities. - with an 8 year commission, after a few years, will collaboration be viewed as "redistricting and consolidation?" Section 2(b)(14) the bill does not say whether the incentives, grants or tax changes will be forced/coerced or voluntary. Will "collaboration" be forced or voluntary? Section 2(b)(13&15) the bill does not specifically indicate what threshold will be used to determine which districts will be considered for collaboration and school building usage: under 2,000 students? Under 40,000 residents? This again creates a great deal of uncertainty. Section 2(c) Refers to a public hearing, but there is no mention that the findings of this commission are not subject to a vote by the legislature. Why not? Section 2(e) says that “reports and plans developed…shall be submitted to… the General Assembly” but again the decisions of this powerful commission are not subject to a vote by the legislature. Why not? Sec 3 says "cooperative and additional collaborative", if these words mean two different things, can one presume that additional collaborative is on a non-cooperative basis, and forced/coerced with the use of incentives. What are the specific incentives? Section (4)(b)(1) No later than 1/1/2020, each municipality "in consultation with the commission" develop a report on shared and consolidated services "including but is not limited to" administrative functions. The non-elected commission has a great deal of latitude in its decision making on future consolidation and regionalization. The final language of the bill remains to be seen, but within a few years, municipal control of ALL schools in the state could be a thing of the past. 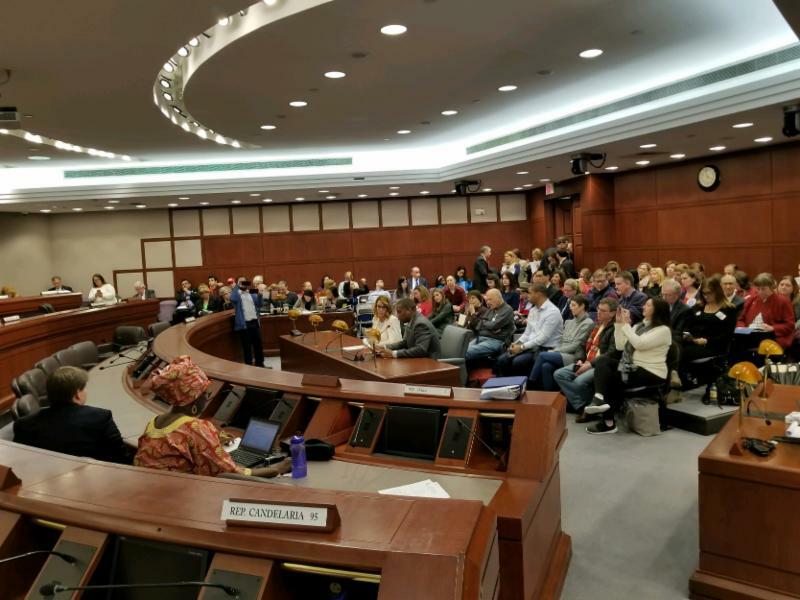 Another recent bill called for the creation of regional school taxing districts, which would be the financial structure to allow for mass regionalization throughout CT and will divert tax revenues from more affluent s uburbs to neighboring city schools. Rather than “breaking” what is working well (CT is ranked #5 in Education) , why not institute a study of failing schools? Shouldn’t the goal here be to improve outcomes rather than just an equalization of all students? Why do some of the companion bills in the House and Senate on collaboration explicitly exclude looking at the very districts (the cities of Hartford, Stamford, Bridgeport, New Haven and Waterbury) that are underperforming? These are the very school districts which are represented by the Democrat Leadership that has proposed all these consolidation bills in the first place, and/or are represented by many of the Democrat members of the Planning and Development Committee and the Education Committee. Not setting up a commission to evaluate the issues within these underperforming school districts defies logic and speaks volumes. These bills have all been focused on consolidation, when in fact there are a number of studies which indicate that de-consolidation of education results in a reduction of costs and an improvement in educational outcomes. Why is the state leadership not looking into the benefits of deconsolidation? KILL ALL SCHOOL CONSOLIDATION BILLS. Focus on fixing what is broken instead. What is going on in Hartford? 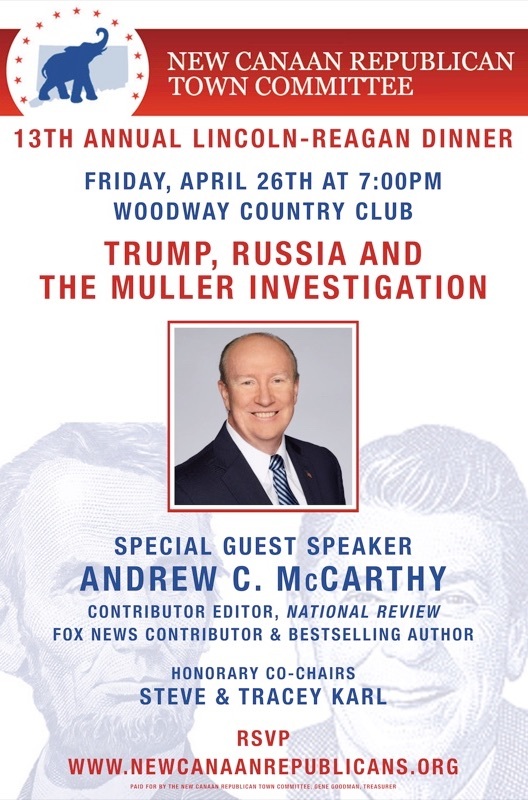 Are you very concerned about Democrat legislative overreach into our local schools, tolls on all highways, unfunded mandates and $2.4 Billion of new taxes from Hartford? Are you ready to get involved on a local level to make a difference? The phrase "all politics is local" has never been more relevant. We need your financial support and we need volunteers! We are expanding our committees and our efforts. To volunteer, contact the RTC Chairman, Pat Donovan at 203-912-1165. Any donations of $50, $100 or $200 would be greatly appreciated. To donate online, link to our RTC form site webpage. 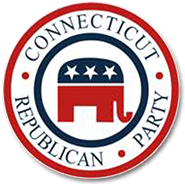 The New Canaan RTC informs and motivates voters in order to recruit and elect the best candidates for local, state and national positions who will uphold the principles of the Republican Party. Visit New Canaan RTC webpage for more information about the RTC, making a donation and the New Canaan Republican Town Representatives. Help support the RTC's efforts this election cycle by making a donation to the New Canaan RTC on the main page of the website. 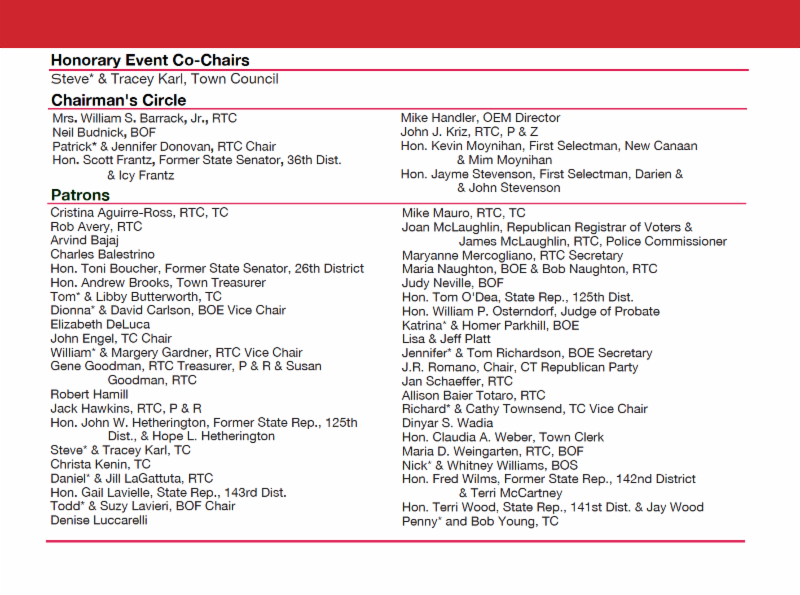 Interested volunteering with the New Canaan RTC or on a town board, committee or commission? Email William Gardner at wmdg@hotmail.com. For voter registration, link to Registrar of Voters or contact Republican Registrar, Joan McLaughlin at 203-594-3096; joan.mclaughlin@newcanaanct.gov.